One night, while I was floating on a cloud, I went to a cloud castle. Inside the castle there was the cloud king and queen. And the cloud prince and princess. Then I got back on the cloud and went to a cloud beach, where there was cloud seas and cloud sand, and I built a cloud cave and in the cave there were cloud mice. And then I got back on the cloud and went home. And woke up. 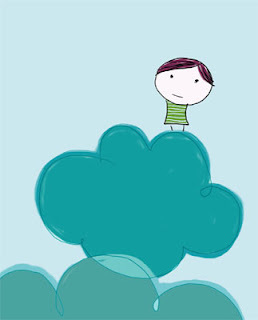 Floating on a cloud and visiting all those places sounds so peaceful! I know! Do U reconize the story? Love the illustration! Don't recognize story, should I?